The European Research Council (ERC) has awarded one of the highest research grants, an ERC Advanced Grant, to Professor Magdalena Götz, currently Chair of Physiological Genomics at LMU Munich and director of the Institute of Stem Cell Research at Helmholtz Zentrum München. Through the Advanced Grant, Magdalena Götz will receive a total of EUR 2.38 million over the next five years for her research work. Götz’ research activities focus on the cells of the nervous system. She investigates how these cells develop, how they behave when damaged and how they can be replaced when lost. With the Advanced Grant, the ERC honors leading scientists who combine excellent research with innovative approaches. The long-term, highly endowed grant supports ambitious, unconventional and pioneering projects that have the potential to lead to a scientific breakthrough in the respective research field. To be selected for the grant, applicants must have an outstanding research track record and have already established themselves as internationally recognized experts, and must specify a host research institution where the research project will be conducted. Since 2004 Götz has headed the Institute of Stem Cell Research (ISF) at Helmholtz Zentrum München and is concurrently Chair of Physiological Genomics at LMU Munich. The biologist is specialized in the study of the cell types of the brain, focusing on stem cell functions and cellular regeneration. In 2007 she received one of the most prestigious German science awards, the Gottfried Wilhelm Leibniz Prize, for her research. 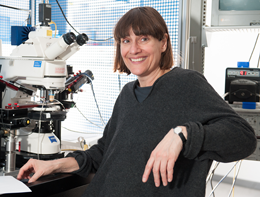 In her research project, Götz wants to elucidate the molecular mechanisms in the development of nerve cells (neurogenesis). Transcription factors, which activate genetic information, have a key function in this process. On the basis of her finding that also cells of the supportive tissue in the brain (glial cells) have stem cell properties, she is seeking to induce reprogramming in these cells to convert them to functional nerve cells.